Iodine has long been recognised as an important element environmentally. Despite this there are many gaps in our knowledge of its geochemistry and even where information is available much of this is based on old data which, in the light of recent data, are suspect. Iodine forms few independent minerals and is unlikely to enter most rock-forming minerals. In igneous rocks its concentration is fairly uniform and averages 0.24 mg/kg. Sedimentary rocks tend to have higher concentrations with average iodine contents of:-recent sediments 5–200 mg/kg, carbonates 2.7 mg/kg, shales 2.3 mg/kg and sandstones 0.8 mg/kg. Organic-rich sediments are particularly enriched in iodine. Soils, generally, are much richer in iodine than the parent rocks with the actual level being decided mainly by soil type and locality. Little soil iodine is water-soluble and much iodine is thought to be associated with organic matter, clays and aluminium and iron oxides. Most iodine in soils is derived from the atmosphere where, in turn, it has been derived from the oceans. Seawater has a mean iodine content of 58 μg/L, while non-saline surface waters have lower and very variable levels. Subsurface brines and mineral waters are generally strongly enriched in iodine. Marine plants are frequently enriched in iodine while terrestrial plants have generally low contents. Iodine is essential for all mammals. 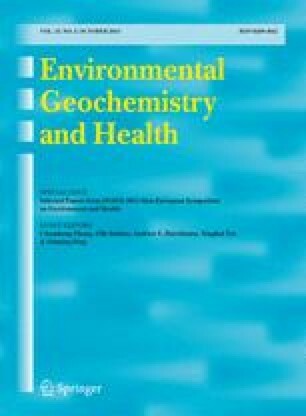 Consideration of the geochemical cycle of iodine reveals that its transfer from the oceans to the atmosphere is probably the most important process in its geochemistry.